I've been patiently surfing Craigslist for the last year looking for a large hutch to finish off one last section of my craft room (here's a look at the last wall). My criteria for the new piece was 1) tall, 2) open and closed storage, and 3) white, and 4) made of real wood. I have quite a few Ikea pieces, but I keep prefer to keep the heavy duty stuff in metal cabinets (like my pattern cabinets) or real wood furniture. I have chosen to use freestanding furniture only as opposed to built ins because some day we may have to convert this into a main floor bedroom for my dad. And, as everything else in my craft room, this last purchase was done on a budget! 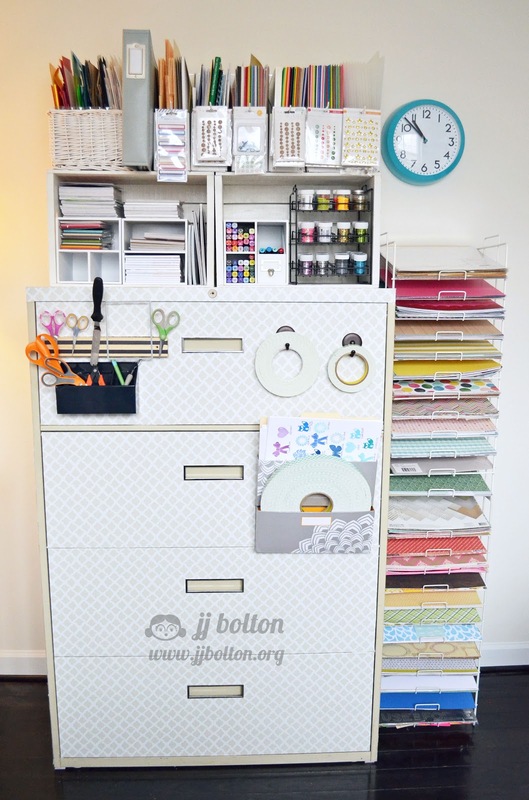 While we're talking craft room, here are a couple little storage ideas that I haven't shared in my past craft room posts. The first is for Copic storage. I keep them in pencil cups from Target in the top of my Raskog cart. This system works really well because the both the cart and the cups are mobile. So much more convenient! 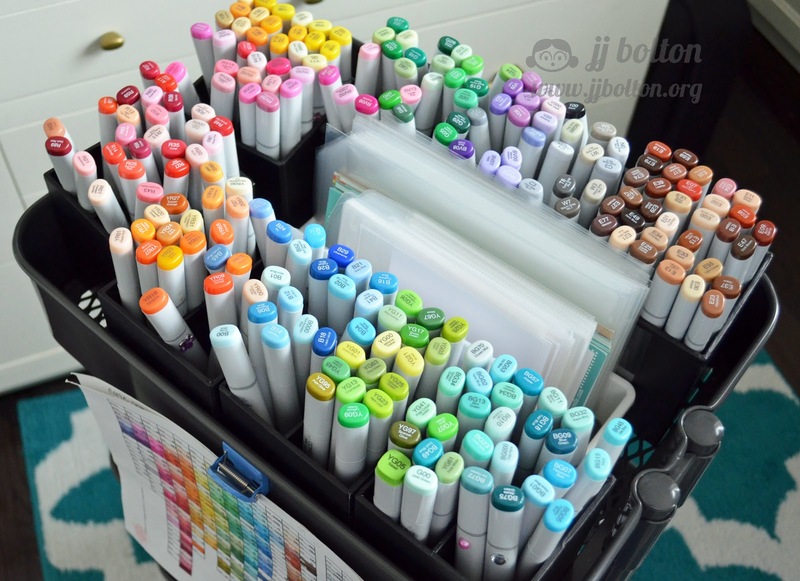 Another Copic tip, create a color chart. I keep mine clipped to the side of my cart with a magnet. A color chart is essential because the color on the tips of the Copics do not always match the actual color of the pen. Go figure! 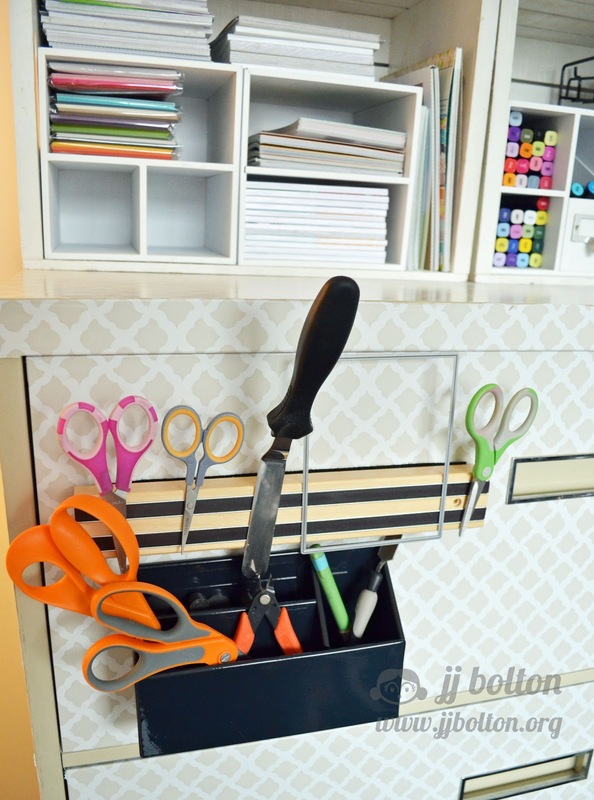 Another tip for storage is a magnetic knife rack. If you are going to do this, get a real knife strip. Don't use the cheapie Ikea one (super weak and you don't want a pair of scissors falling on your foot!). This is a good way to store light weight tools or even dies. This next tip is not so much storage, but more convenience. When you are planning your room, ALWAYS take in to account where the electrical outlets are! I cannot stress this enough! 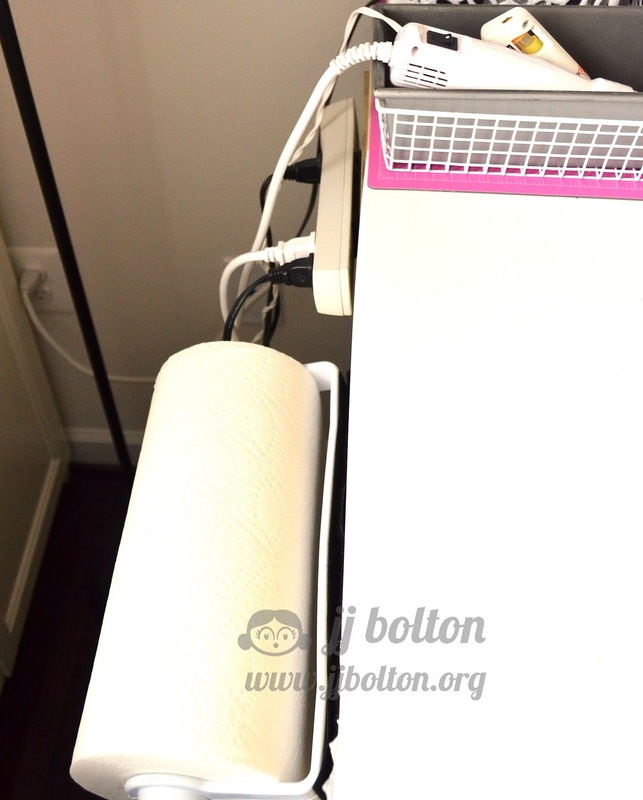 I've used industrial velcro to attach a power strip on both sides of my work table. Makes it so much easier to use my glue gun and embosser (which I keep in an old metal loaf pan for safety). As you can see, I've also attached a roll of paper towels. Thanks to my hubby for the heavy lifting and thank you to you for stopping by! What a great finding, JJ! I also love the quatrefoil paper on the second cabinet, it's super pretty! 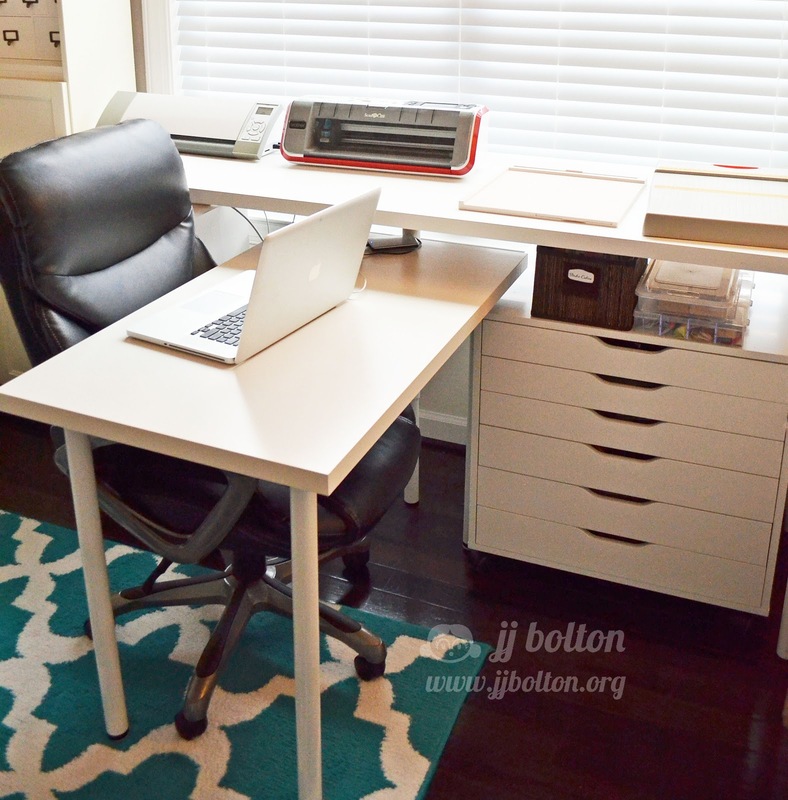 I definitely need that power strip and paper towel holder! Great ideas. Love the new hutch! 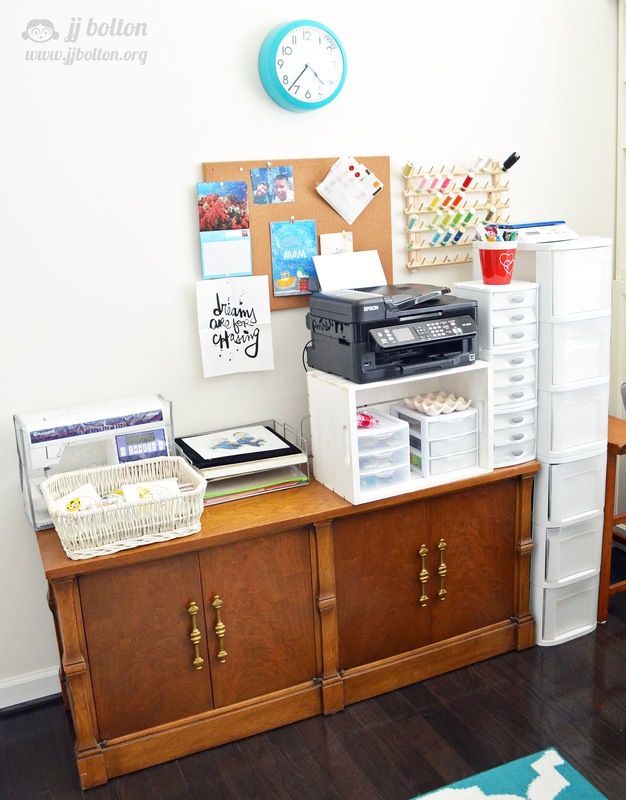 Great craftroom, new hutch and ideas! So excited for you!!! What a lovely room you have, JJ. And hubby! Super, JJ. It fits right in. Thanks for sharing your tips, too. 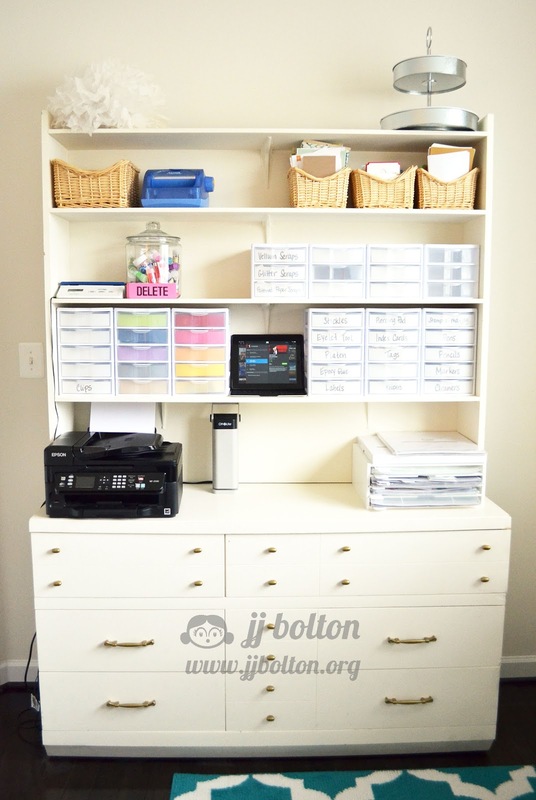 Love the hutch and all of your great tips! great tips and I love the use of the loaf pan! 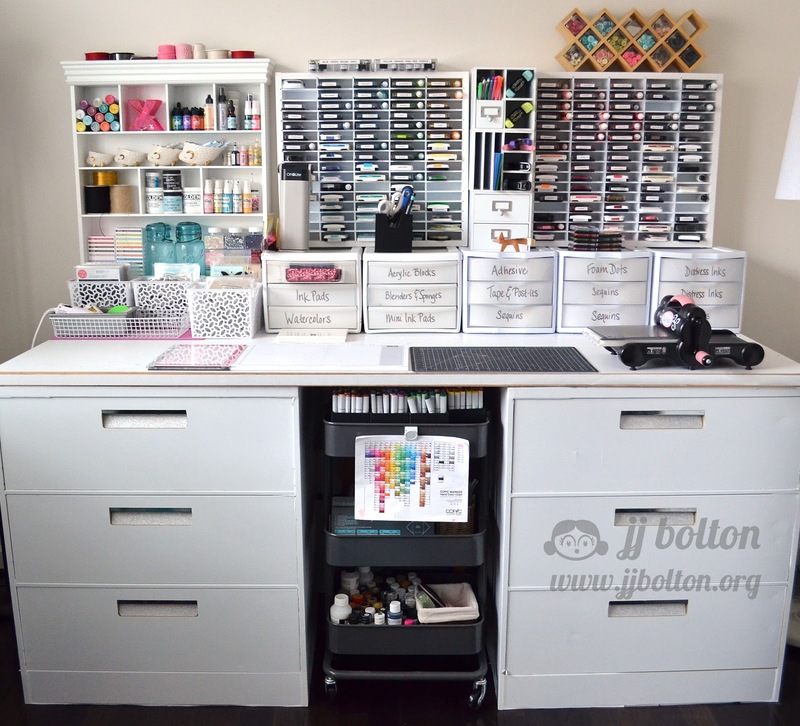 Thanks so much for the visit to your craft room! I love all your well thought out ideas! BEAUTIFUL!!! Great job on all of your hard work :) I'm jealous, but in a good way 😊 I love all of your ideas and thank you so much for taking the time to share and explain.